Combining aman, the Sanskrit-derived word for ‘peace’, and kora or ‘circular pilgrimage’ in Dzongkha, the Bhutanese language, Amankora, is a unique circuit of lodges set throughout the Kingdom of Bhutan’s central and western valleys which affords visitors an opportunity for unique journeys of discovery between them.At an elevation of 2,250metres, Paro Valley is the entry point for most journeys through the Kingdom and Amankora Paro, situated in Balakha Village is just 30 minutes from Paro International Airport. Set around a large flagstone courtyard, a lime-washed stone pavilion houses the living and dining room facilities, library and outdoor terrace, all warmed by fireplaces. 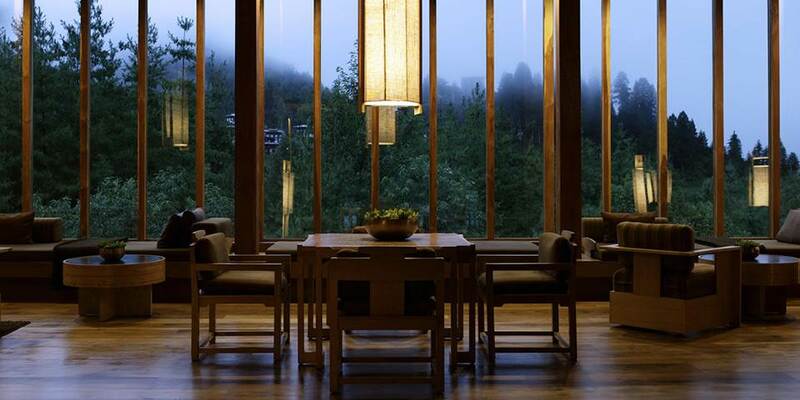 Furnished with comfortable sofas and lounge chairs, the Living Room features floor-to-ceiling glass windows which reveal a forest of blue pines, Mount Jhomolhari which soars to over 7,300 metres and the 17th-century Drukyel Dzong. The warm and cosy setting makes this an ideal spot for sipping drinks and swapping tales. The adjacent Library provides a range of books on Buddhism and local lore, textiles and the Himalayas. Located below the Living Room, the Dining Room opens onto an external terrace which overlooks a small stream and again has views extending to snow-clad Jhomolhari and the ruins of the ancient dzong. Classic simplicity of form meets a warm ambience with communal tables and dark wood walls reflecting historic Bhutanese motifs. The Dining Room serves breakfast, lunch and dinner, with menus specialising in Indian, Western and Bhutanese dishes. There is much to experience around Amankora Paro; a four hour return hike will reach the dramatic 8th century Taktsang or Tiger’s Nest, a highly revered monastery built on a sheer cliff at an elevation of 2,950 metres. The upward hike may be challenging but mules, donkeys and horses are on hand to ease the journey. The town of Paro itself is well worth an excursion, where the National Museum, previously the watchtower of the valley, displays an intriguing collection of artefacts that illustrate the rich culture and heritage of the Kingdom. A short stroll away is the dominating Paro Dzong, a prime example of Bhutanese architecture. From the dzong, a leisurely walk back into town crosses over one of Bhutan’s traditional cantilevered bridges and continues on to the 15th century Dumtse Lhakhang town temple with its altar and beautiful wall paintings. After a day’s expedition, ease the aches and pains by a visit to the Spa at Amankora where traditional therapies and remedies aid relaxation and rejuvenation, the scent of the Spa is cedar wood, which is used as temple incense by the Tibetans. 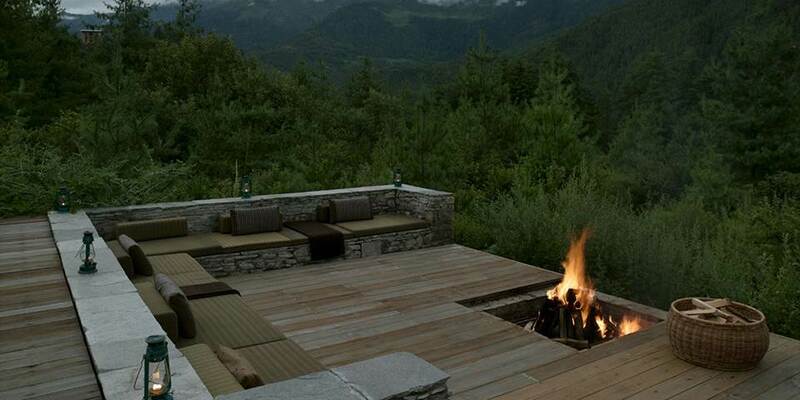 Through smell, touch, hearing, sight and taste, the Amankora Spa strives to capture a sensation which is wholly Bhutanese. 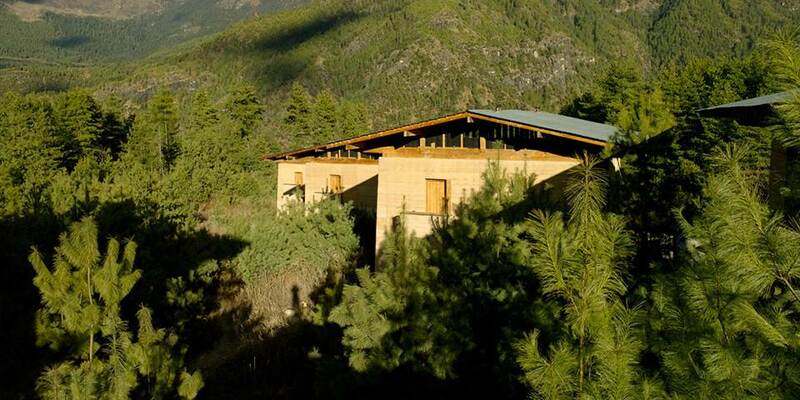 The 24 suite Amankora Paro contrasts rustic elements with contemporary design, with features such as natural rammed earth walls and wood panelled interiors. Each of the suites features a combined lounge and bedroom that is furnished with a king-size bed, banquette window-seat and reading chair. In one corner is the traditional bukhari, a wood-burning stove. Opening from the bedroom is the spacious bathroom which is dominated by a large terrazzo-clad bath, flanked on one side by twin vanities and hanging space, and on the other by a separate shower and toilet.